This entry was posted in Just Life on June 21, 2014 by Steve Tilford. Today is the first official day of summer. I’m not sure if it came fast or slow. It has been pretty hot here in Kansas for the last couple weeks, so it already seems like summer. But, I’ve just been sitting around, so the days are dragging a bit. I did get out yesterday for a little while and flew a remote control airplane, out in the country. 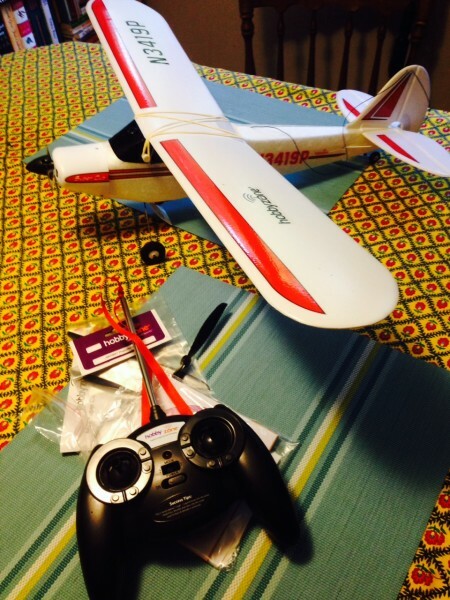 It is a beginner plane, battery powered, but it flew super high. I crashed it after 30 seconds or so the first flight, but got better later on. But, after using up just one battery, I changed it and the battery got super hot and fried the control mechanism, so the plane is busted. I took it apart this morning and looked on the internet to see if I can buy replacement parts. They are around, but not readily accessible. I’m going to watch the Argentina game this morning. I don’t really follow soccer much, but I’ve been watching nearly every World Cup game this past week. Watching the best player in the world is always a good way to get up to speed with the sport. It’s been enjoyable so far. The Tour of Kansas City is this weekend. I’d like to be racing on the Summer Soltice. There is a criterium over there tonight. And then another tomorrow afternoon. I’m not sure if I’m going to go over and watch. I seem to get pretty pooped out after about two hours of doing just about anything. I’m not sure why. Okay, that’s about it from here. Nothing new, same old. And it is getting old. I have been riding the ergometer some. It is really the only time I feel good during the day. It must be in my DNA or something. Just a styrofoam plane, but it was super fun flying. We went out to some land that Vincent owns to fly the plane. His family has been flying remote control planes there for 40 years and they mow the grass just for it. I crashed it pretty quickly. We got better pretty quickly. US Soccer would have to be better than the CRAP being served up and described as the ” BEST “! I hate to think what Parents are going to have to contend with at W/end Soccer , after they have seen their “Idols ” behaving like Spoilt Kids ! Kids Fake,Dive,Pull,Shove,Fest 2B new W/e Footie? Way World Cup Stars exhibit #FAIRPLAY & Refs refuse use of #RedCard NO Surprise possible ! With Van Persie & Cahill getting 2 Yellow Cards , the w/end Kids will think that it is ” cool ” to kick a few of their protagonists & the Fathers will be patting them on the head ? Just realised that i have missed 10 mins of 2nd half of the Argie v iran game , oh well wake me when they grow up ? Shame i can’t post tthee photo of the Soccer Player pretending to be hurt , AND , the Pro Cyclist pretending to be UNHURT ! Steve, a couple of hobbyzone cub hacks/tips, get a P51 10×7 prop, buy a couple, they break, lots more climbing power, better flying plane, also get some bigger wheels for the landing gear, easier take offs and landings, I flew a bunch of these cubs, learned to fly rc on them, I still have some battery’s and chargers I’ll try to find for you, let me know if you go out some evening and I’ll show you how to land, flying is easy, landing is easy once you learn to land with throttle not elevators, I used to be able to land mine in my hand. Lots of fun.